Sheila Bonvallat knows a little something about moving. She has moved a whopping 16 times in her life. Now that she is permanently settled in Brevard County, having been here for more than three decades, she has turned her experience in relocating into a highly successful Realtor® and investor. Sheila was born and raised in Vermont. In fact, she began her real estate career there and in New Hampshire. But when her husband’s job brought them to Florida, she took it in stride and transitioned her family to the Florida lifestyle. An avid real estate investor, Sheila loves buying homes and renovating them for resell. She has invested in numerous properties in Brevard County and has a vested interest in the community. As a Realtor® in Brevard County, she has taken a keen interest in learning the many neighborhoods, and each ones’ personalities and amenities. 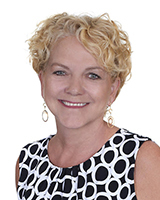 While she is expert in short sales, listings and standard residential, condominium and land sales in Brevard County, Sheila is the area’s Whitley Bay specialist in downtown Cocoa Village. Because of the number of moves she has made throughout her life, Sheila knows the stress of relocation. She is a Certified Relocation Specialist and has made it her goal to provide a stress-free experience to her clients. Sheila provides honest, reliable customer service with each and every transaction. But it’s really her personal touch that makes her a favorite with clients. Sheila goes above and beyond having helped clients pack, paint and remodel. An example of her commitment to her clients is when she helped a client remodel their home, allowing the property to be sold one day after it went on the market. Her attention to detail and eye for what will make a home sell is part of why she enjoys an incredible reputation as a multi-million-dollar top producing Realtor®. Sheila and her husband have two grown children. Fully adopting the Florida lifestyle, Sheila loves going to the beach and enjoys all things related. But she still has a bit of that wandering spirit that made moving so many times easy, so she also enjoys traveling with her husband.